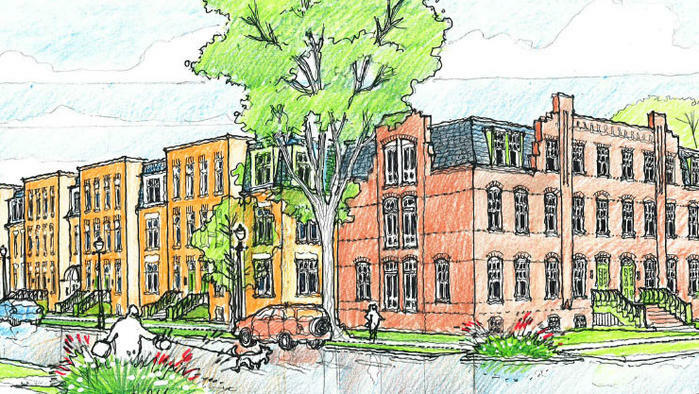 Chicago‘s VOA Associates will design artist housing and community studio space in the Pullman, community group Chicago Neighborhood Initiatives announced last week, signaling another step in the resurgent neighborhood on the city’s far South Side. President Barack Obama in February named the area a national monument, citing its historic significance as a formative environment for American industrial might and organized labor, including the country’s first African-American union. In spite of economic decline over much of the 20th century, the neighborhood retains a handsome collection of Romanesque and Queen Anne–style architecture, as well as a strong sense of community. The new project, dubbed Pullman Artspace, includes 45 artist apartments at 111th Street and Langley Avenue near the new McDonough + Partners-designed Method manufacturing plant, a forthcoming community center, and the Walmart-anchored shopping plaza that in 2010 became the first major development there in years. Artspace is a nonprofit, national chain of art galleries based in Minneapolis. VOA’s involvement is the latest news in a long process of revitalization. Earlier this year The National Parks Conservation Association (NPCA) and AIA Chicago mulled the changing neighborhood’s future in a design charrette titled “Position Pullman.” Chicago Neighborhood Initiatives and others have been working for years to turn around the neighborhood, successfully rehabbing dozens of historic row-homes and inviting attention—along with new investment—to the area.